In theory, charging drivers for using roadways at peak times is a great solution to traffic jams. But Seattle could roll into a host of unintended consequences. Congestion pricing for downtown Seattle, as proposed by Mayor Jenny Durkan, is based on an elegant economic concept. It relies on market forces, specifically the price mechanism. If prices are higher to drive downtown during the most congested hours, demand for driving will fall. Problem solved, or at least eased. An added bonus is making a dent in the existential threat of climate change by reducing greenhouse gas emissions. But elegant theories don’t always work in the real world. Congestion pricing in Seattle would run up against a variety of barriers and produce unintended consequences. One was discussed by my colleague Danny Westneat: The burden would fall disproportionately on the working poor. To be fair, a study out of Portland found that most peak-time drivers had high incomes. But a City Council committed to social justice would almost certainly have to carve out an exception for low-income drivers. And what about tradespeople who are essential for maintaining and improving the central core? They drive workshops on wheels. Sure, they could pass the costs along to their customers, but they could make a strong case that they, too, should be exempt from congestion pricing. London lets off disabled drivers, licensed taxis and motorcycles. 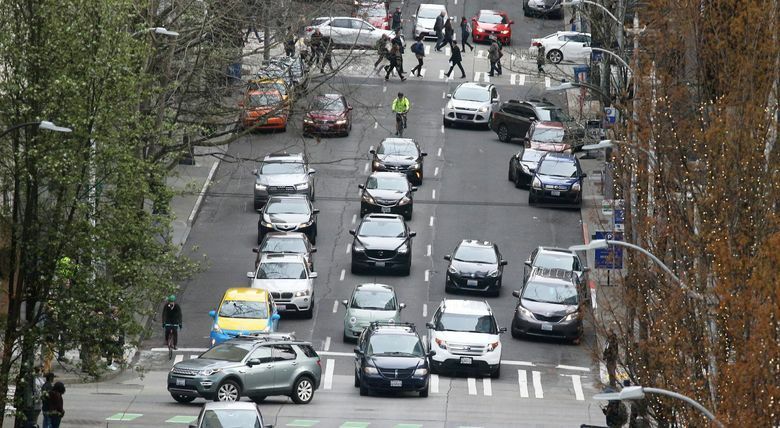 Uber, Lyft and other ride-sharing services would lobby for relief in Seattle. Pretty soon the elegant concept would become a Swiss cheese of loopholes. Policymakers should also be prepared for unintended consequences. For example, local retailers that make Seattle distinctive are already fighting for survival against e-commerce rivals. Losing customers who would be less likely to pay a congestion fee to drive in would be another coffin nail. The magical Xanadu comic shop that closed this year was hurt by the loss of a few parking spaces out front. A dense, vibrant central core is one of Seattle’s biggest strengths — good for the environment and the city treasury, too. Any policy that risks it — causing employers and other assets to relocate to suburbia — deserves special deliberation. Even without congestion pricing, single-occupancy vehicle use to the center city has dropped dramatically, even as downtown jobs increase. More people are taking transit, walking and cycling. More are living closer to their employment. Unfortunately, Seattle runs up against limits. The lost subway, mostly funded by the federal government, continues to haunt us. The timetable for ST3 is far too slow. A plan to quick-step light rail to Ballard and West Seattle is badly needed. And Durkan has paused, and might kill, the Center City Connecter, the most important streetcar line. Sorry, but most residents are not going to become athletic cyclists in this hilly city. Some are disabled. And buses alone are not enough — they get stuck in traffic, face capacity issues and are less appealing to transit riders. Also, a segment of the population that isn’t wealthy must drive. Perhaps they live far from even a bus line. Or their business requires mobility (think Realtors). Or their employer has fixed hours that coincide with peak congestion pricing. Finally, most Americans across the political spectrum believe driving is a god-given right. Never mind the decades of subsidies and social engineering (e.g. freeways to whites-only suburbs) to enable Happy Motoring. The ability to get behind the wheel and zoom independently on cheap gas is the essence of freedom. Even highway tolls bring out cries that we’re on the road to serfdom. Hence, not even New York City has mustered the political consensus to implement congestion pricing. Manhattan has survived immense traffic jams for decades and remains the nation’s capital of commerce and culture. Seattle’s clogs are wee tykes by comparison. Only a statewide or national carbon tax, or a massive increase in gasoline prices, will change this deeply embedded custom. (And no, Elon Musk is not coming to our rescue with a hyperlink. Self-driving cars are still cars, causing congestion. This magical thinking is merely more reason for delay. We see how the magical thinking of 1970, voting down the subway, worked out). The few major cities where congestion pricing has been successfully implemented — London, Stockholm, Singapore, Milan — have much more advanced and multimodal transportation systems than Seattle. All have extensive rail mass-transit systems. Drivers here already pay a congestion fee of sorts in lost time and productivity (one of the joys of rail transit is the ease with which someone can work during the commute). They pay in frustration, too. This is why it’s a benefit to keep roadways relatively narrow. It provides an incentive for people to take transit or make different living arrangements. Seattle’s unusually constricted geography also helps. Unlike a Dallas or Phoenix, it lacks endless flat spaces for wide freeways and sprawling subdivision pods. So in a way, a congestion “tax” — or at least disincentive — is already operating here. A constructive and pragmatic city leadership would be focused on building more rail transit as quickly as possible. It would learn the best practices in Asia and Europe about ways to lower costs. But it would build. Therefore, I predict we will soon see a congestion-pricing law in Seattle.